If a close friend calls you a hoarder, it’s time to organize. If all of the drawers in your kitchen are junk drawers, it’s time to organize. If you swear you own an iron, but can’t (for the life of you) find it, it’s time to organize. That’s why we’re here. At Maxi Maids, we provide professional organization services, as well as cleaning services, so you can rest assured that you have the cleanest, most organized, most talked-about home in town. Now let’s get down to business. When is it time to get organized (on top of the aforementioned reasons)? 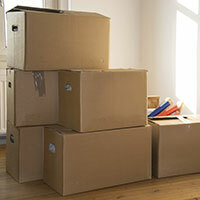 If you haven’t opened up boxes since your last move, you’re long overdue to get organized. And because you haven’t used anything in those boxes since the move, it’s likely that you can get rid of most of the things that have sat there gathering cobwebs. If you simply have too much stuff, check out our article on how to cut clutter. Cabinets, surprisingly, are built to shut. If you have a cabinet that’s overloaded with an assortment of random mugs, glassware, and plastic cups that you’ve accumulated from various gas stations and fast food restaurants, it’s time to organize and reassess your belongings. Once again, take a look at our cut the clutter article. It’s so much easier to not fold clothes than to fold them. However, if you don’t like wrinkles, and if you prefer to keep your drawers shut, it’s time to make folding a part of your routine. Also, consider paring down your wardrobe—do you really need three pairs of overalls? OK, you can keep the overalls, but do you really need to keep that Bon Jovi shirt with the holes in it? OK, you’re right, you should keep that too. Remember, if you’re sick of folding your laundry, we provide in-home wash, fold, and organize services! 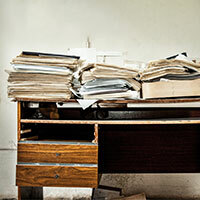 Your office is more of a haystack made of paper. You swear that you had a keyboard at one point, and surely there’s a mouse in there too. If you have issues keeping your office clean, it’s time to invest in some filing cabinets, a shredder, and one of those newfangled paper-to-digital document converters. While it’s alright to keep a few items on the counter (your electric toothbrush, the soap dispenser, a box of tissues), your countertop is flooded with toiletries. There’s your mouthwash, your perfume, his cologne, deodorant, eye drops, reading glasses, contact solution, floss, a rag, cotton swabs, cotton balls… well you get the point. You can outfit your drawers and cabinets with space-saving shelves to keep all of that extra stuff off the counters. If you have a home that’s a mess, we’re here to help. We provide both professional organizing and cleaning services for folks throughout Springfield. Count on our team of friendly maids to help you reclaim your home!